Tim Burton and Disney have done great things together. Well, perhaps ‘great’ isn’t the right word. Tim Burton and Disney have made boatloads of cash together. Indeed, this whole ‘live action revival’ trend likely never gets off the ground if Burton’s 2010 adaptation of “Alice in Wonderland” doesn’t make $1 billion worldwide. Sure, that movie was a hot mess, but $1 billion worldwide! And Johnny Depp at his commercial peak. Ahhhh, simpler times. It’s easy to see, then, why Burton was drawn to adapting “Dumbo” as well. It takes place in the circus, giving Burton carte blanche to cast the film with a bunch of lovable oddballs (as an added bonus, longtime Burton collaborator Danny Elfman’s score basically writes itself). Also, Dumbo himself is as Burtonian a character as they come. Innocent and kind but different, and therefore the subject of ridicule (see: Edward Scissorhands, Frankenweenie). And while they right a few wrongs from the 1941 original, they leave several other wrongs in place, because the story can’t move forward without them. These wrong things were barely tolerable 78 years ago; they’re flat-out unacceptable now. It is 1919, and Holt Farrier (Colin Farrell) has returned to his life in the circus after serving in The Great War. While Holt was away, circus owner Max Medici (Danny DeVito) bought a pregnant Asian elephant named Jumbo, with the hope of using the baby elephant to goose ticket sales. When the baby is born, he has impossibly large ears. Max is horrified, but Holt’s children Milly (Nico Parker) and Joe (Finley Hobbins) accidentally discover that the elephant’s ears enable him to fly. Audiences are dazzled by baby Dumbo, as is entertainment kingpin V.A. 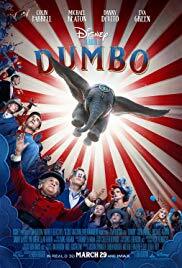 Vandevere (Michael Keaton), who offers a partnership to Max and acquires Max’s entire crew to be part of his destination entertainment complex, where Dumbo will be the headliner alongside trapeze artist Colette Marchant (Eva Green). What Max and the rest of the Medici troop don’t know is that Dumbo is a pawn in a much bigger game. Adults are the worst, they don’t listen to children, and they are easily corrupted: it’s one of the oldest tropes in movies designed to appeal to children, and for all of the changes that are made here, for God knows what reason, they leave that one alone. The movie actually goes one further by emotionally handicapping the children as well. It is possible to have a young actor show an emotional core buried beneath thick layers of trauma, but Parker treats Milly like a 12-year-old Angelina Jolie cosplaying as Wednesday Addams (fun fact: Parker is Thandie Newton’s daughter), and while that seems quirky – and therefore a very Tim Burton thing to do – it is not at all what this movie needs. The kids are the heart of the film (the human heart, anyway), so when even they don’t show a lot of emotion, that’s…that’s not good. Which is unfortunate, because the elephants look amazing. Vandevere’s entertainment complex – Disney has rarely poked fun at itself as much as it does here – is extraordinary. DeVito is impeccably cast as the cheap tyrant circus boss. (Burton regular Keaton, meanwhile, looks uncomfortable in his own skin, as if the two had never worked together before.) CGI Dumbo is one of the most lovable creatures Disney has created in ages. There are lots of little things that the movie nails, but it gets nearly all of the important things wrong. Which brings us to “Dumbo” screenwriter Ehren Kruger. Kruger has written some great scripts. Okay, he wrote “The Ring” and “Arlington Road,” which were quite good, but he also wrote three “Transformers” scripts, “Reindeer Games,” “Blood and Chocolate,” and “The Brothers Grimm,” the last of which would have ranked as my worst movie of the Aughts had it not been for “Hostel.” How he was chosen to write this one is a mystery. There is nothing in his body of work that suggests that he would know anything about writing a story about the bond between a mother and her child, and there still isn’t. Lastly, and this is the most frustrating part, Dumbo, a baby elephant who can’t possibly be older than three to six months by film’s end – if that – seems to understand everything humans say to him. Humans, who are speaking English, not Elephant. Dumbo just understands them, because the story needs him to understand them. It’s a ridiculous thing to ask, and yet the story asks it of him again and again. “Dumbo” isn’t cause for Disney to shut down production on the live action revival movement, but this might be a good time to pump the brakes. They need to recognize that some of these older animated films lend themselves to modern-day adaptations better than others. Dumbo himself is pure of heart, but everything else about the original is cruel, inhumane, and deserves to be left behind. And yet, they’ll probably make their money back on Dumbo merchandising alone. Sigh.